BECOME PART OF THE NEW MOUNT PLEASANT COMMUNITY ART SCREEN! April 14 – one spot left! This spring, grunt gallery and EastVan Digital Stories join forces once again with Mount Pleasant and Vancouver residents who wish to create short videos around the theme of PLACE. Artists Lorna Boschman and Sebnem Ozpeta will host a series of six, free, weekly workshops at grunt gallery that walk participants through the process of digital story making! Through the digital stories group process, you will be able to create and share your own authentic story by combining digital photos and/or video. Selected videos from the workshops will be shown on grunt gallery’s Mount Pleasant Community Art Screen and on digitalstories.ca. To sign up for one workshop, please choose one day (from the dates listed above), please include one alternative date in case your first choice of the workshop is filled. Send an email to Lorna Boschman: lorna (at) digitalstories (dot) ca with your name, email address, phone/text number, and whether you live in Mount Pleasant or Vancouver. Please include one, or two, sentences about why you would like to create a short digital story. Lorna will send you a list of things you must bring to the workshop including several photos (from your phone or camera) and/or video that directly relates to your story’s theme. Special thanks to the Vancouver Foundation who made this project possible. Vancouver Foundation is dedicated to creating healthy, vibrant and livable communities across BC. Since 1943, our donors have created 1,800 endowment funds and together we have distributed more than $1 billion to charities. From arts and culture to the environment, health and social development, education, medical research and more, we exist to make meaningful and lasting improvements to communities in BC. “Now a number of prominent players on the local art scene are working to save the little cabin that tells a big story about Vancouver’s history. The waterfront area was once home to a number of squatters – many of whom were artists, including the author Malcolm Lowry. He lived in a series of shacks in what is now Cates Park, where he wrote much of his classic Under the Volcano. 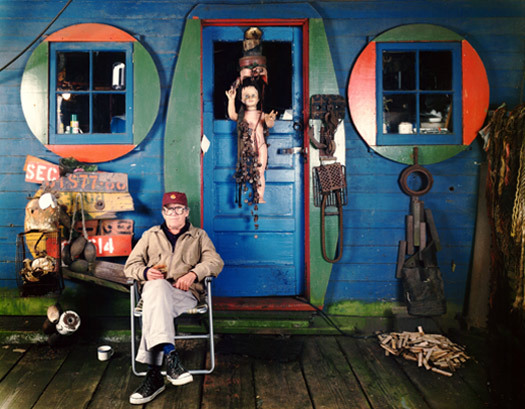 The nearby cabin that has been home and studio to Mr. Neil and Ms. Itter is believed to have been made in Coal Harbour by a Scandinavian craftsman in the 1930s. 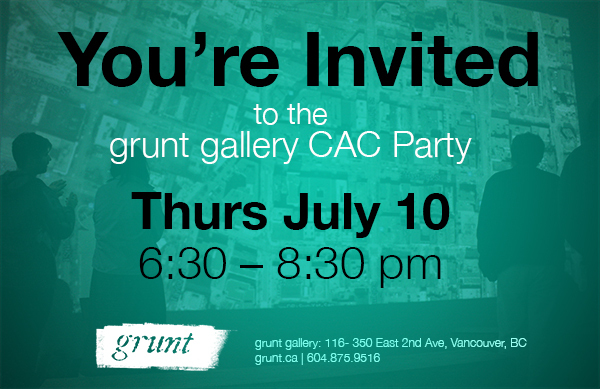 You’re invited to a special event at grunt gallery to celebrate the Community Amenity Contributions (CAC) funding that we’ve received. The event takes play at grunt on Thursday July 10 (6:30 – 8:30 pm). Statements by grunt’s programming director and co-founder, Glenn Alteen, and a board representative, will take place at 7pm. Join us in raising a toast! We look forward to seeing you there. “This is wonderful news for grunt as well as for the communities active within the Mount Pleasant area. The cultural vibrancy of this neighbourhood has seen incredible growth despite shortages of affordable rental space for artists to live and work. The project uses the popular computer game Minecraft as a tool and studio to create new and incredible structures in a virtual world. Youth participants will be mentored by professional artists to explore their creative processes and discover new ways to approach art making through a collaborative, online, video game environment. Follow the development of the virtual studio by subscribing to gruntCraft’s YouTube site. As part of the studio program, youth studio members (aged 11-18) will have access to professional artists feedback and mentorship, 3D printing workshops, and opportunities to participate in studio open houses at grunt gallery. gruntCraft will occur from July to December 2014 and is led by artist and project manager, Demian Petryshyn. Please visit gruntcraft.ca for more information and project updates. We’re on the lookout for youth participants and volunteers. Feel free to check out the studio server at: 50.23.129.103. If you are interested in becoming a youth studio member (aged 11-18) or would like to get involved as a volunteer, please contact Demian at gruntcraftvancouver@gmail.com or visit gruntcraft.ca for more info (coming soon). (Vancouver, BC) – grunt gallery is pleased to announce that it has received a major cultural capital grant worth $400,000 from the Rize Alliance Cultural Amenity Contribution (CAC) fund which supports arts organizations in and adjacent to the Mount Pleasant area. This contribution will allow us to pay off our mortgage and support purchasing more space in the near future. grunt gallery’s long history in Mount Pleasant demonstrates an operationally sustainable, non-profit arts organization that serves the surrounding Mount Pleasant area. In 1995 grunt purchased a facility in the Main Space building on East 2nd Avenue and has continued to contribute to the cultural ecology of Mount Pleasant and Vancouver. CAC’s funding will pay off the remainder of grunt gallery’s mortgage, which provides grunt with the incredible opportunity to begin planning facility expansion. The fund will also supply $240,000 towards the purchase of a new facility. Ultimately, this funding positions grunt gallery to look towards a bright future of new and innovative capital plans that continue to serve the Mount Pleasant community and surrounding Vancouver public. grunt gallery was founded in 1984 and has had a long-standing relationship with the surrounding Mount Pleasant community since its inception. 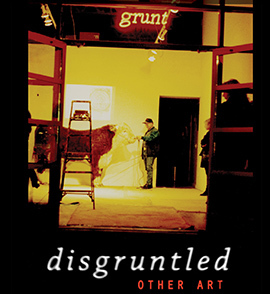 With projects such as the Brewery Creek Mural project (1986), and the Mount Pleasant Community Fence project (1994), and supporting the development of local theatre festivals such as Vancouver Fringe Festival, the LIVE Biennale, the PuSh Festival and much more, grunt continues to support local businesses and organizations to become a well-integrated cultural staple in the Mount Pleasant community. In the mid-‘90s, grunt gallery worked with local developers to build a space that provided our organization with a mortgage that was as cheap as the rent had been in the gallery’s old location. This collaboration with the developers provided grunt with the current gallery facility that they occupy today. In 2006, the province provided Renaissance funding for non-profit organizations to take advantage of endowment funds as long-term investments through matching funds to provide future sustainability. grunt gallery took $150,000 of their building equity to apply towards their new endowment fund, the grunt gallery Legacy Fund. Our endowment has also had the support of the Heritages Endowment Incentives Program, which has been matching our donations since 2006. Since then, $545,000 has been raised in the endowment, which has provided almost $100,000 in interest towards the operating and program costs of the organization. Hours: 20 hours/week with a flexible work schedule. The Curator of Community Engagement works with board, staff, contractors, volunteers, and membership to develop contacts and strengthen relationships between the grunt and grunt’s partners in the community. This is a professional position that reports to the Program Director and Operations Director at grunt gallery. The Curator of Community Engagement is a planner, implementer, and relationship builder who is responsible for developing grunt’s community plan. They are also responsible for developing strategies around retention and recognition of donors, audience members, volunteers and other grunt communities, as well strategies for outreach. 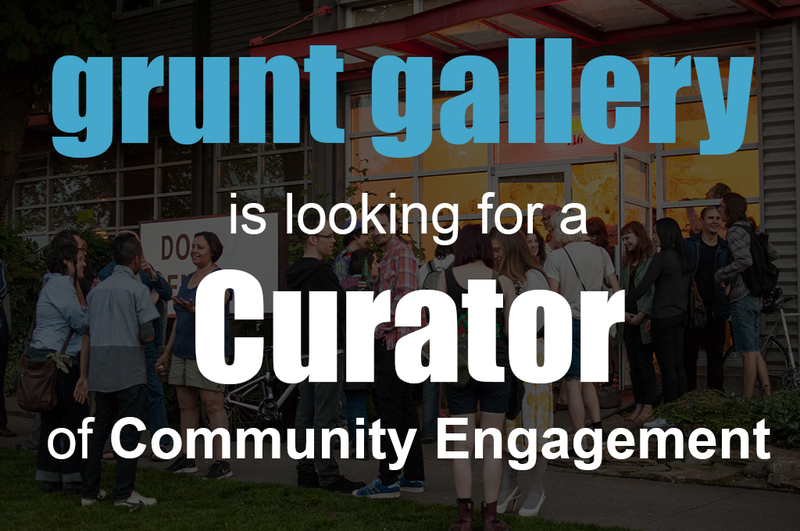 The Curator of Community Engagement will take advantage of grunt’s strengths in order to build strong, long-term and loyal relationships with audience members and the community. Comments Off on Curator of Community Engagement!